Anything that grows has a natural rhythm to its growth: starting out, forming, flourishing and eventual decline. This rhythmical pattern can be seen, again and again, in natural systems, in political systems, in human systems, in organisation systems – in all kinds of contexts. The pattern can be illustrated visually on a graph using “S-curves”. S-curves can be drawn in a mathematical way. This has application when the “growth phenomenon” of interest is trackable quantitatively. For example, turnover, market share and profitability, at both product and aggregate levels, are typical growth phenomena that can be modelled using S-curves, tracking either growth rates or absolute values. From these models, estimates of future rates of growth can be calculated. These calculations indicate likely future performance ranges and signal when replacement activities might be needed to supplant the declining phenomenon. S-curves can also be used in a figurative, non-mathematical, way to examine and gain insight into patterns over time in relationships, careers, learning cycles, organisation development, phases of projects, stages of innovation and many other social, technological and political phenomena. There is natural life cycle for growth and decline in these systems. Nothing that grows can continue to grow indefinitely. Eventually, and inevitably, decline sets in and it cannot be prevented. In organisations, the question is not how to defend against, or how to cushion this decline, but instead how to manage the natural “rhythm of the seasons in a productive way”. 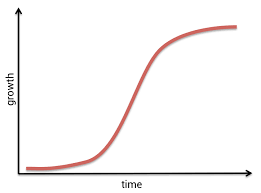 For example, in a sales organisation, the natural product life cycle follows a “bell-shaped” curve, where the atrophy curve is a mirror-image reflection of the growth curve. The trick is to create a new S-curve of growth underneath the apex of the original S-curve by refreshing the original product or by launching a new product. In practice, organisations are made up of scores and scores of S-curves, the exact mix will vary according to how you choose to look at the organisation’s affairs. Individual product S-curves taken together could form a larger product class S-curve. For example, taken together in sequence, a series of S-curve product life cycles can trace a larger S-curve, over the full elapsed time period, describing the growth and decline pattern of the product class to which the individual products belong. Similarly, a product class S-curve could be one of many product class S-curves which taken together over time will describe a product sector. And so on. There is fractal like quality of ‘self similarity’ to these S-curves as you zoom out or zoom in and vary the scope of detail under analysis. This kind of analysis can be applied to any other quantitative data of interest in the organisation, e.g. expenses, earnings, share data, etc. In complex organisations, with many projects in play, the portfolio of projects can be assessed with S-curves using, for example, Earned Value Analysis as metric with which to draw the S-curve. Alternatively, using qualitative phases of projects, the portfolio can be analysed in a figurative way. 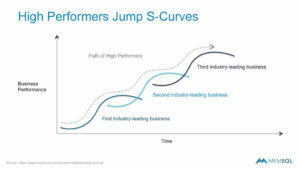 Leaders must pay attention to the portfolio mix of S-curves in play in their organisation at any one time. 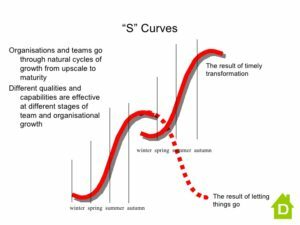 If most S-curves are approaching or are at their peak at the same time then the organisations’s resources will be consumed by these S-curves while contributing little to strategic development. Consequently, leaders always face the challenge of escaping the seductive trap of rigidly staying for too long with a set of successful ventures. New S-curves are always needed and the skills to transform from old to new are demanded. Leading a product, a project, a division, a team, an organisation through the various stages of an S-curve makes different kinds of demands on a leader or on a team of leaders. Soon after, on the S-curve, the skills to design a future must be available and applied intelligently. These design skills are not common in organisations, and when present are all too neglected. Many new initiatives fail because what they have in inspiration they lack in sound, sustainable foundations for development and growth. The next stage of an S-curve requires the skills to upscale a ‘new business’ of some kind. Followed in due course by the need to be able to operate the business effectively and efficiently. The knowledge, skills and experience demanded here are in the territory of what good old fashioned ‘line managers’ have been doing for many decades. The emphasis then morphs with the S-curve into a challenge to ‘squeeze profits’ out of the S-curve. This calls for a particular kind of operator mind set: focus, relentlessness, savvy and experience. Eventually, the foresight, courage and determination are needed to ‘downsize creatively’. The capacity to ‘let go’ of a cash-cow type operating model once it’s clear the cash is going to dry up calls for experience and grown-up thinking. ‘Squeeze profits’ and ‘downsize creatively’ may well have to be applied concurrently. The time will come when there’s a need to think about the next S-curve, possibly some time before the apex of the existing S-curve is reached. The organisation needs the maturity and wise leadership to see this need and to handle the leap from the old to the new. It is very unlikely that the varying attributes and skills to successfully manage all the stages of an S-curve are all possessed to a sufficient degree in one leader. In fact, the ‘operate the business effectively and efficiently’ phase of an S-curve – depending on the metric or metaphor and the degree of ‘zooming-out’ – may run for many years. It is easy for an organisation to have these skills in abundance (if the organise manages its human capital intelligently or is just plain lucky) but at the expense of having leaders with the skills needed at the start of an S-curve or the skills needed to leap from one S-curve to a new S-curve. Wise CEOs, COOs, division heads, project directors, etc. will spot the relevant strengths in their executives and instinctively assign them the tasks most suited, i.e. the parts of an S-curve that draws the best out of them. Organisations that operate this way can be said to operate with strategic diversity and strategic agility. But to assemble and deploy the talent to lead an organisation in this way can be a hit or miss exercise. Fortunately, there is a scientific way to increase the quality of the match, to increase strategic diversity and strategic agility. Having regard to this information and using it proactively has several advantages for the organisation. Strategically important tasks are accomplished more effectively, with greater velocity, by more enthused and fulfilled teams of executives, to the clear advantage of all stakeholders. –Neil Rodgers, The Rodgers Group, London, England. 2017.